Because March is both Women’s History Month and the time for the annual Elizabeth Cady Stanton Conference, Joanne Quinn, graphic designer, worked with Lisa Sewell, PhD—associate professor of English; director of programming, gender and women’s studies—to create an exhibit celebrating women’s suffrage and emancipation and the Conference. Poster-size photographs of notable women form an eye-catching frame for the exhibit: Elizabeth Cady Stanton (1815-1902) on the Conference banner (top, center); along the left side Susan B. Anthony (1820-1906), Lucretia Mott (1793-1880) and Anna Howard Shaw (1847-1914); and on the right Lucy Stone (1918-1893), Alice Paul (1885-1977) and Sojourner Truth (1797-1883). While all of these women worked to achieve women’s rights, some are better known than others. Elizabeth Cady Stanton, Susan B. Anthony, Lucretia Mott and Sojourner Truth are probably familiar names. But who are Anna Howard Shaw, Lucy Stone and Alice Paul? Shaw was an ordained Methodist Protestant Church minister, a medical doctor and, in 1892, the vice president of the National American Woman Suffrage Association (NAWSA); she became NAWSA president in 1904. Stone is the first woman known to have kept her maiden name after marriage; she was also an advocate for women’s rights and those of black citizens. Current Falvey employee Becky Whidden, Access Services specialist, is a descendant of Stone. Alice Paul was a women’s suffrage leader who introduced the first equal-rights-amendment campaign in the United States. She earned her law, master’s and doctoral degrees in the 1920s. PowerPoint slide shows, below the Conference banner, highlight fascinating “Women’s Suffrage” images. Stephanie Liu, student employee with Falvey’s Scholarly Outreach team, created two slideshows, “Women’s Suffrage” and “Resources and Databases,” that border a poster announcing the keynote speech for the Elizabeth Cady Stanton Conference. At the top of the window, opposite the large image of Stanton, is a framed photograph of the keynote speaker, Stephanie McCurry, PhD, Department of History, University of Pennsylvania. 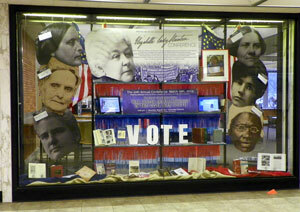 A large white VOTE sign; flyers; photographs; a variety of books about women’s history topics; two American flags; and red, white and blue fringed banners complete the exhibit.